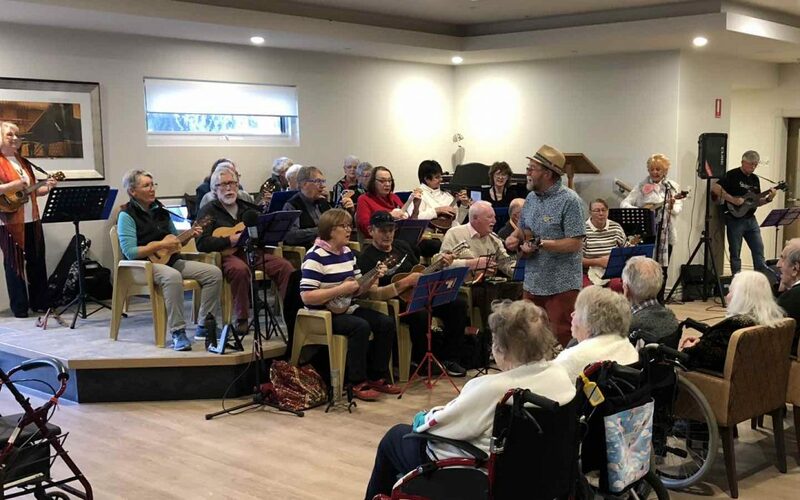 The ukulele group returned to Village Glen Aged Care Residences (formerly known as Ti Tree Lodge) on Wednesday 18th July. We performed a one hour set and entertained around 60 people plus support staff. The residents and staff were very happy with our performance (I heard a few shouts for “more” towards the end). Considering our casual approach to performing (when do we actually rehearse ? ) the group sounds better each time we go somewhere ! Before I had packed my uke away I was asked if we could come back next month (Wednesday August 8th) ! – of course we can! But next time we are going to bring along a video guy or gal to capture some of the day. It’s about time your family and friends found out how good we are. We now have a huge repertoire of songs so I reckon we could front up time and time again with a great selection each time . Eily Watson came up and sang “Hey Good Looking, Henrietta Saks helped me with “Run Around Sue” and Kathy Coffey took the lead on “Molly Malone”. All were excellent. It’s good to see people stepping up and giving us a song. We recently had Alan Tickell sing a very emotional version of “Fiddlers Green”. So a special thank you for those who came along and brightened the day for the residents. And a special thank you to Peter Williams who laid down an excellent foundation on his bass. He’s come a long way in a very short time !